The AwareOffice is an technology equipped office environment like a meeting room supporting various actions like scheduling, presentation, annotation and providing different services concerning these actions. The goal of the AwareOffice initiative is to provide a real world test bed setting for ubiquitous computing (UbiComp) applications. Therefore we trace two directions opening up a technical and a user-centric view. Within the technical view various technlogies for long term and reliable operation facing the tough contraints in the real world are developed. Apart from this the AwareOffice is strongly used to explore new kinds of interaction paradigms especially focused on implicit interaction and unobtrusiveness. In this user centric view people within the environment should be encouraged to use UbiComp technologies beyond the time of testing which demands further a focus on the aspect of affordance. In order to accomplish the vision of UbiComp test settings and comprehensive evaluation scenarios are strictly necessary. We agree with the idea of a living lab, but strengthen further its extension into a real world test bed. The weak point we see in the living lab is that researchers or more general the developers of the UbiComp technologies themselves are the test candidates in these settings. This works in the stage of hands-on testing in order to correct implementation mistakes. However, as a real world evaluation we consider a test setting with people who were not involved in the development of the technology. Therefore the AwareOffice iniative is accomplished in cooperation the SAP Campus Engineering Center (CEC). The two views spanned over the goal of the AwareOffice initiative are explored in different ways. Within the technical view we look for sensor and communication technologies in order to aquire environmental information. In particular, technology is used to get a knowledge about the situation it is operating in. Situation information is needed to let the technology react in an adapted way in a dynamic environment like the AwareOffice where actions cannot alway be fixed in time and space. Herewith, concepts of context aggregation and context aware computing are used, but also plain technical data like battery level, physical characteristics like link quality in case of wireless communication and so on. With TecO’s own creation of a generic communication, sensing and computing platform, an outcome of the Smart-Its project, many of the technical challenges in a real world scenario can be addressed. Sensor technology is used to aquire basic situation information like temperature, light, audio volume, orientation, etc. Basic contexts are then derrived from these information before they are communicated via a broadcast channel. Therefrom a more broad survey of the situation can then be created. Nevertheless, this approach needs a comprehensive evaluation in terms of various tough contraints like adhoc communication, energy awareness, robustness, scalability, and diversity. Within the user-centric view in the AwareOffice setting we focus in investigations of new interaction paradigms coming up with a technology so small-scaled and powerful that it can be integrated into many everyday objects. Using different object as a tangible and graspable interfaces for actions in this setting is an exciting way of controlling traditional office technologies. In our approach, an office user interacts often implicit with the technology. Whether he needs to be still aware of the technology is an open question which seeks for an answer. This kind of questions are investigated by user studies. In particular, we concentrate on people who were not involved in the development. These are people who maybe know what the technology can do for them, but find their own way to use it. Especially we are interested in these emerging behavior patterns. In order to explore both views, the technical and the user-centric one, we used TecO’s generic communication, sensing and computing platform. Based on them we build various artifacts like movement aware chairs and pens, displays, e.g. an electronic doorplate, an InOut board representing In, Out and in the meeting and other sensor devices measuring for instance temperature, light, open/close state of doors and windows. Some of them will be presented with a short explaination. The devices one can see in the picture below have all capabilities to sense their environment in terms of acceleration, pressure, temperature, audio and light, are able to process these values to context information using an onboard 20 MHz micro controller with 8 additional KB RAM and communicate these contexts via a broadcast channel. The communication protocol is strictly synchronized and allows adhoc communication within 13 milliseconds after being in range to an already synchronized network. The communication stack is energy aware and enables a runtime for about a year (see chair appliance). The chair appliance – a chair with an attached artifact device – was our primary setting where we carried out implementation, evaluation and tests for power saving methods. We have now reached a state where this appliance can run up to a year. The chair appliance runs the chair movement perception application interpreting certain movements of a chair as for instance, s.o. is sitting on the chair, the chair is moved. The detected status information is then communicated to artifacts in the environment via a broadcast channel. 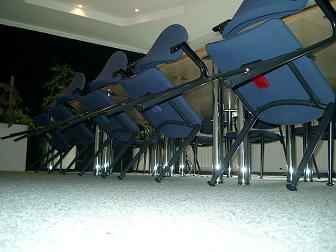 The information sent out by different chairs can be used by other artifacts for e.g. the detection of meeting (see Meeting Support). The perception needs only to work if there is a movement, otherwise it the device does not need to be supplied unless the network protocol requires certain actions. This ensures an operation over a period of about a year. In both cases people might disturb a meeting by entering the room not knowing that there is a meeting. As a consequence of the spontaneous nature of, for instance a meeting extension, participants cannot be asked for an explicit action in order to enter this extension into a management system which then distributes the event to displays or calendars. Therefore an implicit approach was chosen to detect meetings and inform other systems and people outside the room. Thereby the previously described chair appliance for sensing chair movements and display artifacts in form of electronic doorplates were used. The following figure shows this setting. 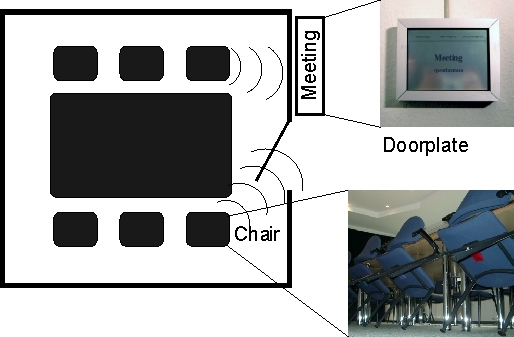 In this setting movement events registered by chairs are sent via a wireless communication as context information for presence of persons. An electronic doorplate artifact uses these information and creates a meeting context which is then represented by an appropriate message on the screen. Furthermore, backend applications like meeting room management systems can perform an update on their data bases. Integrating TecO’s platform in pens like board markers offers a broad range of applications ranging from triggering caused by taking or laying down the pen to recognizing of movements. 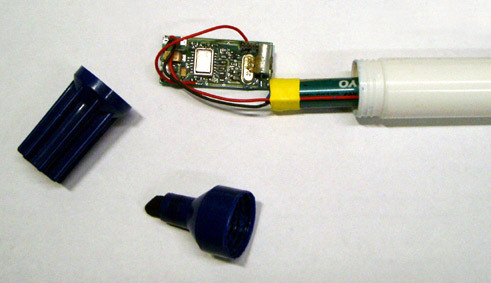 Therefore such pens can be used as simple switches for other applications and even for gesture recognition. Like the chair appliance the pen needs only be supplied if it was moved. This results in a compareable runtime.